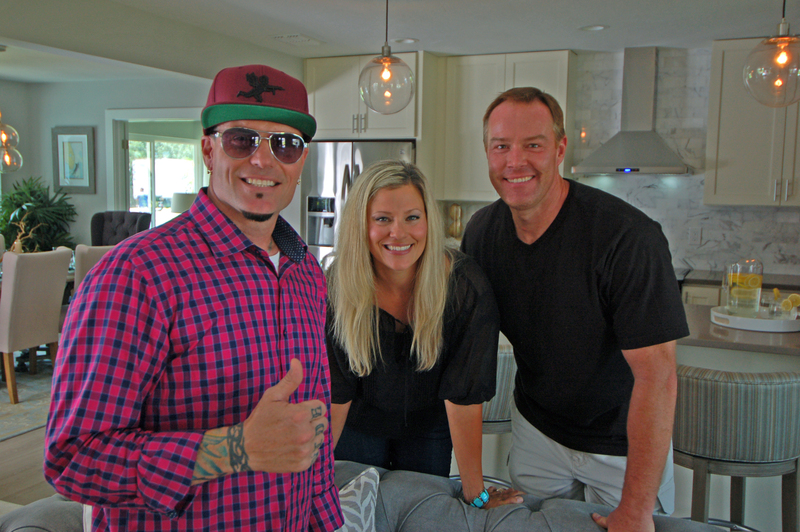 Belmont alumni Chad Bowers, marketing and music business 1998 graduate and his wife Rachele Sweiderk Bowers, management and music business 1999 graduate, had their lives ‘flipped’ this weekend when they won “Vanilla Ice Flip Advice’s” home renovation competition. After purchasing a “neglected” Floridian home in November 2015, the Bowers started their research on complete renovations. Being first time home flippers, they stumbled upon a promotion of the new show on HGTV.com and decided to apply. Outside of owning a home in Florida, being an energetic first time flipper was the only requirement—the Bowers were immediately interested. After applying, the flippers were chosen for a round of video interviews before participating in an in-person interview at their new property. Soon after, the Bowers were notified of their progression in the process and flew to Palm Beach, Florida to make their final pitch to the show’s host Vanilla Ice and designer Krista Watterworth. Their on-camera presentation emphasized their home’s potential for a successful flip. Before any new projects begin, Chad and Rachele are heading to Europe for three months for a long vacation—backpacking Northern Spain’s Camino de Santiago. When they return, it’s back to “Flip, flip, baby” for this home renovation duo!